So your new truck is sitting in the driveway and you've been thinking of ways to make it special. One of the easiest ways to change the appearance ... and have everyone jealous ... is a billet grill. "billet grilles truck grills" is a popular search term as is "Billet grills for pickup trucks" pickup owners use to find information on how to improve the look of their truck. Dodge offers a factory billet grill but the spacing between the slats is a little much for me. Chevy makes you take some kind of honeycomb. I just like the looks of an aftermarket grill better. You probably do too. Sometimes you don't want a Chevy or Ford OE look and want to be different. Everybody else has what the factory chooses for you but you don't have to go along with the pack. Don't forget about bumper inserts. Dodge has the holes in the front bumper and this addition creates the finishing touch. Installation is not as difficult as you might think on a Chevy. There are some small tabs welded to the back of the grill and those line up with the factory holes usually in the same place the factory grill was fastened . You wont need a rocket scientist to assist you ... the directions are very good. This applies to Dodge billet grilles as well. The Fords can be a little tougher. You actually have to take the grill out and cut out the chrome part of the grill. Its all plastic and we use a jig saw to cut it out and a grinder to touch up the edges. It takes time but ... boy is it worth it! Instant change! Sometimes the billet grills come where the slats may have gotten bent in shipping but its real easy to bend them back into a uniform spacing. If you don't think you're the mechanically inclined type or just don't have the time then maybe you should consider the E-Z Applicade series by Stull. 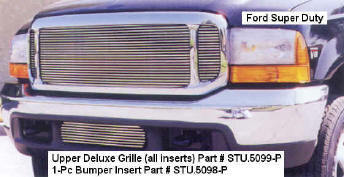 The Stull E-Z Applicade Billet Grills fit over the factory grill and requires no cutting or removing. If you look real close, really close you can see the bolt sleeves that extend from the back of the grill but its really not noticeable. Talk about saving time ... you simply slide it over the top of the existing factory grill and screw about 6 wing nuts on and your done.